Hamstrings- the muscle group in the upper back of the leg opposite our thigh. The hamstring group is used to help us bend our knee and perform hip extension — backward movement of your thighs. Although the gluteal muscles in your buttocks are the main muscles that perform hip extension, your hamstrings assist with this motion as you move from sitting to standing, squat and jump. Hip extension performed by your hamstrings also helps propel your body forward as you run. The hamstrings are often under utilized while the opposing muscle group (quads) are over utilized. This creates imbalance. The front of the legs becomes over dominate and the back of the leg becomes weak and looses its flexibility. Too much sitting is another culprit for weak hamstrings and glutei. If you are sitting on these muscles for 6-8 hours a day…they are not working! If they are in this “turned off” state day after day, the hamstrings become short, tight and weak. Hamstrings need to be flexible. Tight hamstrings are a major contributor leading to back pain and knee pain. What can we do for our hamstrings? First, a steady diet of FOUNDATION TRAINING is a great place to start. Foundation Training, is the perfect posterior chain training technique to stretch and strengthen the hamstrings. If you want to keep doing the same old single leg hamstring stretches you have been doing for years…fine, but Foundation Training is better…and that’s a fact! Isolated stretching is not going to accomplish what Foundation Training can do by stretching the whole posterior chain as a unit…period! Secondly, when working out at the gym for every quad exercise you do make sure you do a hamstring focused exercise. Squats and deadlifts are ideal…if properly done. If you know Foundation Training…you will be mechanically prepared to do squats and deadlifts properly. Thirdly, stop,sitting all the time! Get out of the chair and move around. I have a desk job and I get up every 15 minutes or so. I’ll throw in a little desk stretch or founder. When I get home I’ll sit on the floor just to get my hips into a full range of motion. 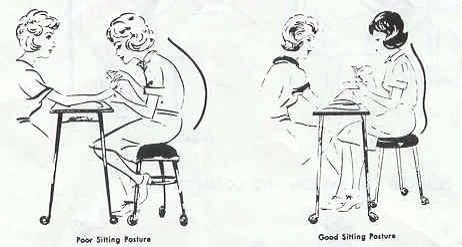 Work on your posture. The hamstrings also help us balance our bodies. If they are weak or tight we tend to bend at the waist and tip forward…this is how the back issues start…and never stop. What’s the best exercise for posture? That’s right…FOUNDATION TRAINING! Gain control of your body again. Don’t let time, age and gravity bend you up like a pretzel. FOUNDATION TRAINING will give you the awareness and tools you need to stand up tall, manage pain, move well and feel well. Sitting All Day is Risky! Prolonged sitting significantly impacts your cardiovascular and metabolic function and can leave you at greater risk for heart failure and other heart-related problems. One study claims that exercise may not even be able to counter the cardiovascular risk caused by sitting. In fact, the authors of the study write that the positive health benefits of one hour of exercise can be counteracted by six hours of uninterrupted sitting. The good news is that you have virtually unlimited options when it comes to breaking up your sitting. From standing desks and office-friendly intermittent exercise to short walks, all of it counts. Standing up or bending down increases the force of gravity on your body, and this is the key to counteracting the cellular degeneration that occurs when you’re sitting down. A recent study has been found that taking a five-minute walk for every hour you spend in your chair can reduce the heart disease risks associated with chronic sitting. Stand up and do a decompression pose, walk down the hall, step outside and breathe some fresh air, take a walk after you have lunch…fight the harmful effects of sitting, poor posture and gravity. You can do this!. WHAT’S HAPPENING TO OUR BODY FROM SITTING? What happens to your body as you sit for long periods isn’t pretty. You are essentially putting your metabolism into hibernation! Your muscles stop moving, your heart rate slows, and your body practically stops burning calories. Combine a barely-moving metabolism with our bad habits of eating in front of the computer or television, and you can easily see why people who sit are more likely to be overweight. Sitting also leads to colon issues, digestive issues and other internal disorders. We are meant to move…you can not move if you are sitting! 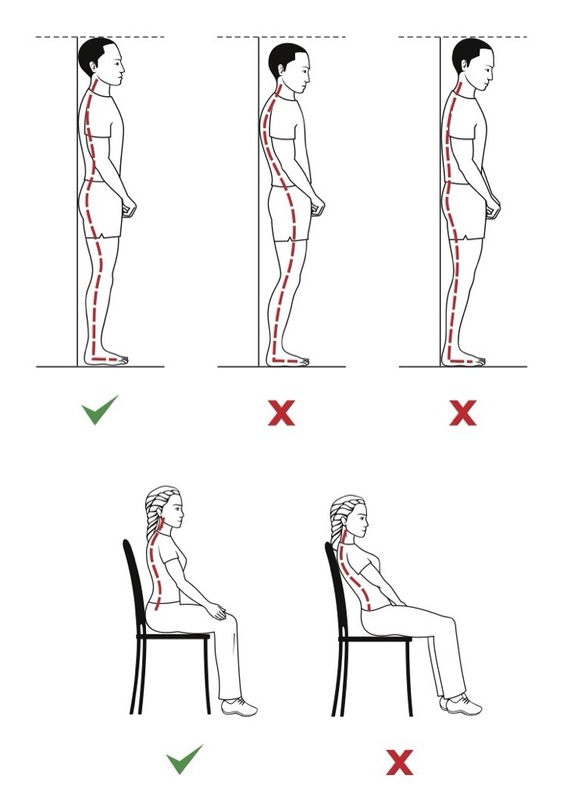 I have been studying about posture, movement patterns and problems with sitting for the last year. I practice and teach FOUNDATION TRAINING pretty much everyday to help counteract the harmful effects of sitting. I now stand at work as much as possible. Even with what I know now I still sit to much. I just try to be aware when I’m sitting to get into a better position. When we sit for more than 8 hours (especially if we are sitting in the wrong positions, slouching, with our legs crossed, or leaning towards a computer screen), our bodies literally get STUCK in positions they were NEVER designed for. 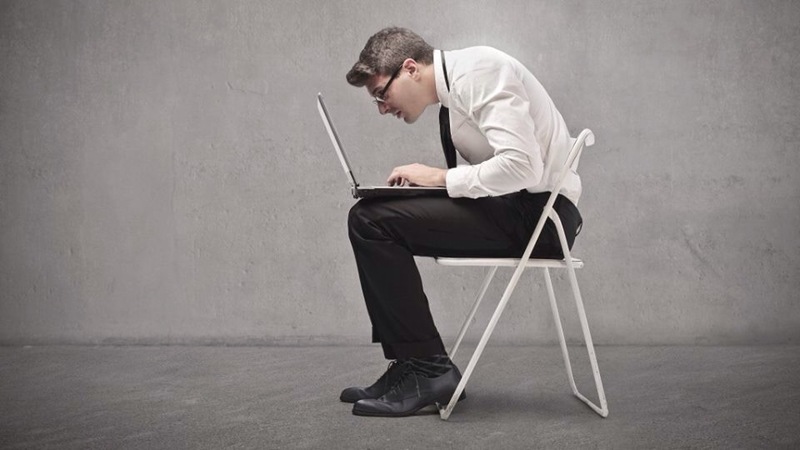 After years of sitting (in school, at work, at home), our heads lean forward, our shoulders slouch, and our spines form a C shape that can cause years of unbearable back pain. But you don’t have to surrender to gravity! Gravity is going to be there always…forcing us into these hunched over positions. We are built to stand up against gravity…FOUNDATION TRAINING will get you tall again in the correct position to strengthen the weak posterior chain that has been created from sitting and poor posture. 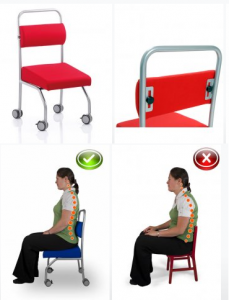 HARMFUL EFFECTS OF SITTING INTERNALLY…GET UP NOW! I am posting part of an interview DR MERCOLA did with DR LEVINE from his article, GET UP! WHY YOUR CHAIR IS KILLING YOU AND WHAT YOU CAN DO ABOUT IT. We have got to get up from our desks more! This includes school age children, college students, and the everyday 8-5 employees. I have added better work habits to my health regimen also. I stand as much as possible at work. I’ll take a break and add a Founder. I feel better, have plenty of energy and am constantly aware of my posture. This will pay dividends as I age. Read the section below to see how harmful sitting is for you internally. There you have it from some experts! Stand up and move as much as missile… This is your health! Contact me for a FT session. Gift certificates available for the holidays. Give the gift of better health! Sitting is the new smoking! Readers…we have got to stop sitting and start standing more. I realize this is 2014 and everything around us is about our comfort. I love to go home in the evenings and get in my big comfy chair and watch a little TV just like anyone else. A person who will stand up at their desk through out the day can burn an extra 500-1500 calories per day. Not only will you burn some calories…your muscles will not get so short and tight from sitting therefore they will not pull on the joints as much. Experiment with this… For example, if the phone rings at your desk stand up to take the call. 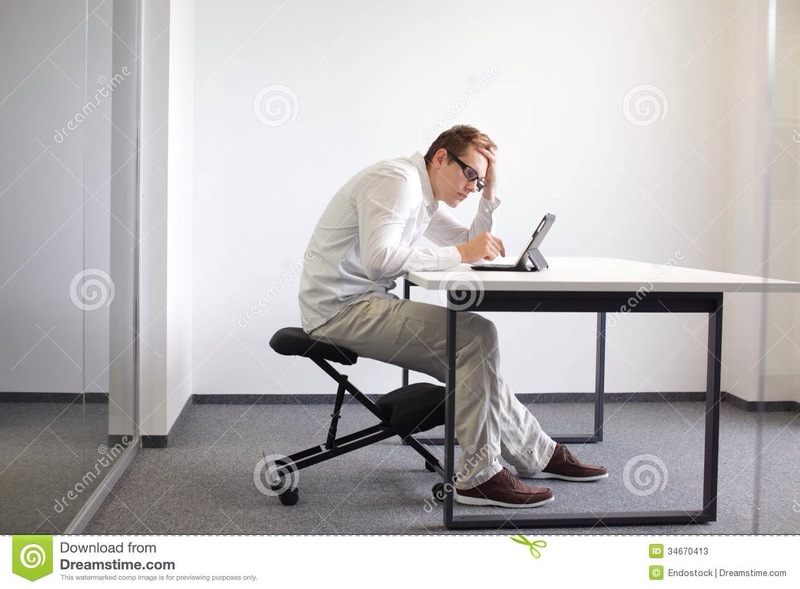 I type at my desk by getting into a wide stance founder position. I let my hips and buttocks support me while getting a nice hamstring/calf stretch. Every 30 minutes or so take a walk down the hall and back. Practice decompression breathing or do Founders through out the day. Walk around the building after lunch. There are so many things you could think of to get movement into your daily work life. This is serious stuff people…WE HAVE TO STOP SITTING SO MUCH! Like I remind everyone everyday…FOUNDATION TRAINING works. We must learn to decompress thru the day. Lengthen and stretch thru the day. Bring oxygen into our lungs and cells to help heal. FOUNDATION TRAINING will accomplish all this and more! Contact me: To change the way you move, the way you feel…FT will change your life! Gift certicates available…FT will make a great holiday gift for a loved one in pain. People actually sit like this all day at school and work. These poor postures wreck havoc on our bodies. This is a fixable issue…awareness is the key. Most of us go to our jobs everyday to sit behind a desk and do paperwork, crunch numbers, check people out, do internet work, or no telling what else. There was a study done showing a person needs to get up every 15 minutes to counteract the harmful effects from sitting. That’s over 30 times per day in an 8 hour day. Everyone… This topic is important! Sitting causes so many body problems…which can lead to internal health problems. Let’s take control of this problem! Every 15 minutes stand up…do some decompression breathing. Do a FOUNDER. Walk down the hall. Step outside if the weather is nice and breathe fresh air. Of course, I purpose learning FOUNDATION TRAINING to stretch and strengthen your posterior muscles. Practicing FT daily…you will automatically know when you are sitting poorly, slumping your shoulders, walking with your feet pointing outward, stomach just hanging there. Practicing FT daily…you will know how to correct these poor body mechanics which lead to improper movement patterns. These improper movements patters are the ticket to back pain, and health problems. You can counteract the effects from sitting and any other repetitive activity with Foundation Training. Click on Foundation Training in the bottom left hand side bar to order the book and/or DVD. The DVD is very easy to learn from and you will change the way you think about moving! Of course, i would love to teach you or your group…just message me.